Have you begun to notice signs that your parents can no longer care for themselves the way they used to? Perhaps you’ve seen expired food in the refrigerator or empty shelves in the pantry. Maybe you’ve noticed that your mom’s clothes haven’t been washed in a while, or your dad isn’t taking showers. Or maybe your parents have gotten more feeble and you worry about them falling. These concerns can raise some difficult questions, and they can cause a lot of stress as you consider the best way to broach the subject. As you think about discussing the topic with your mom or dad, you want them to know that you love them and respect their wishes while also communicating your concern for their wellbeing. It’s a difficult conversation to have, but there are some meaningful ways you can help soothe emotions as you talk to your parents about getting the help they need. 1. Start before help is needed. - Where do you see yourselves in five years? - How would you feel about getting some help with housework? - How can I help make you more comfortable? Questions like these encourage your parents to start thinking about the future, especially if they are already experiencing some difficulty in keeping up with household responsibilities. It’s a great way to open the conversation without causing your parents to feel incompetent or vulnerable. 2. Probe for underlying issues. If you hear some resistance in your mom or dad’s answers, probe for the deeper issues that may be causing concern for them. For example, if they absolutely refuse to consider a caregiver, what is the reason? Are they afraid they will have to give up their independence? Are they afraid you’re trying to push them toward a care facility? 3. Take their concerns seriously. 4. Include them in the decision. As you talk with them, discuss various options and ask for their opinion. When they tell you what they think, listen. Remember that your parents may be struggling with the idea of having their son or daughter lead the discussion. They are used to being the parent and it may be difficult for them to allow you to take the lead. You can alleviate some of the awkwardness by indicating you are offering help and support rather than taking charge of the situation. Try to view the situation from your parents’ perspective. The more you can empathize with the emotions they may be feeling, they better you will be able to identify solutions that they are comfortable with. 6. Ask your siblings to help. If you have siblings who also want to be involved in your parents’ care, ask them to help you communicate the right message in the right way. When your mom or dad receive support from multiple sources, they may be more open to considering a change in their current situation. Even when we know our parents need additional help, admitting to ourselves that they are no longer the strong, capable people we grew up with can be extremely difficult. You may experience fear of the future, guilt that you can’t do more, resentment toward siblings who won’t take a more active role, or frustration that your parents don’t want help. In these situations, it’s important to know how to process those emotions in a healthy way so that you don’t burn out. Take breaks. Caregiving can require a lot of time, but don’t allow it to consume you. Take breaks when you need them and stay involved in other parts of your life that are important to you including social connections, work, and hobbies. Forgive yourself. You may experience feelings of guilt that you weren’t closer to your parents growing up or that you live far away. Forgive yourself for any perceived missteps and acknowledge that establishing your own separate lifestyle does not mean you care for your parents any less. Get rest. Emotions seem more intense when we are tired. Getting enough sleep at night is an important part of having the energy you need to handle difficult decisions and interactions. Plan ahead. Fear of the future may not ever resolve completely, but you can manage it by creating contingency plans. For example, have an emergency kit ready in case your mom or dad has a healthcare crisis so that you know where important documents and medical information are. Talk with siblings. Chances are good that they experience many of the same emotions you do. Talking with each other can help all of you find peace with the situation, support one another, and create a caregiving plan everyone can contribute to. Acknowledge the hard truths about caregiving. Because we love our parents, it can sometimes feel like a betrayal to acknowledge that caregiving is hard. But the truth is that everyone experiences difficult emotions, stress, and challenges juggling all the responsibilities of life as our parents’ need for caregiving increases. Acknowledge these hardships and release any feelings of guilt you may have about them, so you can focus instead on loving and caring for your parents in the way that provides peace of mind for all of you. Sometimes, no matter how much we want to be available to our parents, the reality is that we can’t provide the level of care they need on an ongoing basis. When that is the case, consider reaching out for additional help. A home caregiver is a great place to start as you think about helping your parents remain in their home while also getting assistance with things like housekeeping, personal care, and meal planning. 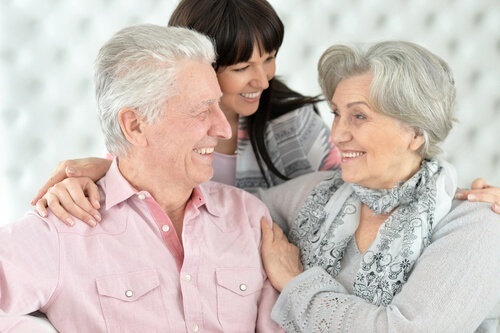 If you are ready to find out more about how a caregiver can help your parents maintain their independence at home, give us a call. We would love to talk through your mom or dad’s needs and help you understand the various ways home care can support them.